This seems by my time to working on projects using web annotating. 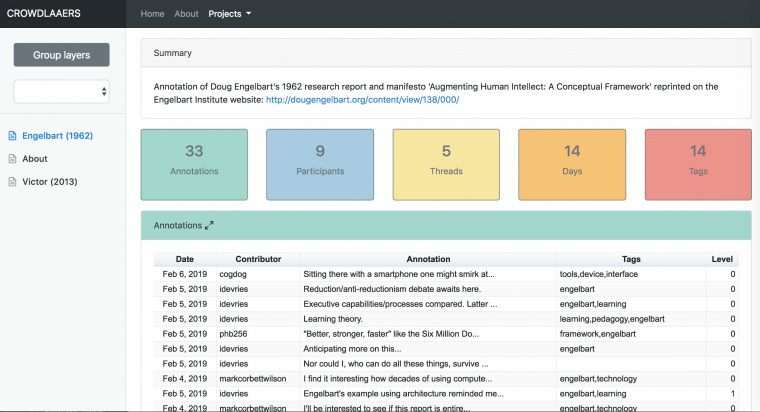 As noted early, we are planning more extensive use of hypothes.is in netnarr but the really Big Show is taking off this week, the project with Gardner Campbell on Annotating Doug Engelbart’s Augmenting Human Intellect: A Conceptual Framework. Some of the background has already been laid bare (okay my new to blogging students, that is know as a link- it gives context without a need to explain in full depth). My piece of the pie has been building the web site and working with Gardner on the plan for the project. That’s the set up of the meal, what happens hinges on folks sitting down at the table. The project web site— more cool stuff below the fold! For this project’s site I went with the free Fluida theme, same as I used for the Mural UDG project. It’s not let me down, it has tons of flexibility for the front page. Like most sites, this one did not start with some detailed design scope, it’s been more in the bread making style of kneading and shaping as we go. And damnit, there is flour all over the kitchen! More about the bolts and nuts below. The aim of the project is… well you can read it. And annotate it. The project is going to be a 3 week effort to coordinate as many people as we can to read Engelbart’s 1962 paper with each other, and use Hypothes.is to annotate, augment, discuss and add meaning to three main sections identified by Gardner. This is what I coined Week (hey like an array, we start counting at 0!) a week to ramp up interest, but also orient people to thinking about Engelbart and getting people up to speed with using Hypothes.is. I’ve not found that people have too many problems with it, but wanted to create a 3 part step in. It follows an approach I set up for our netnarr students. Rather than sending people off to Hypothes.is to create accounts and read their intro materials (which are quite good)– it can all be done in action, and in place on our site. We enter people into Hypothes.is by having them visit our About page – by having the Hypothesis WordPress plugin enabled. This means the tool is automatically turned on, and just by having people click the tool in the top right to open it’s “drawer”, they can either login if they have an account, or create one right there. The idea here is to have them practice annotating and commenting on this page, using it as a place to do intros (we already have 15 responses to that request). The second step, Annotate Anywhere, has a dual purpose. One is to demonstrate how you can turn Hypothes.is on anywhere, by either using a browser tool (Chrome Extension or bookmarklet for Firefox, Safari) or by knowing how to make/use a via link, the URL method of turning Hypothes.is on any page. The other purpose is to lay out the larger focus of the project, so well written by Bret Victor’s tribute. The easiest to Hypothesize yourself is using a “via link” https://via.hypothes.is/http://worrydream.com/Engelbart/ — if you are a savvy reader of URLs I bet you can see how to use Hypothes.is anywhere. There’s a strong message in Victor’s post, I heard when I was looking for images to use in the post. I was really hoping to find an image of Engelbart writing, or reading, or sitting at a desk pondering. But nearly all the images are him with the Mouse, or doing The Demo, or at a device (well there are many images of him in a group of people). In Victor’s closing paragraph, and asking about the world Engelbart hoped to create, we hope, is a place people get to in their annotation work. 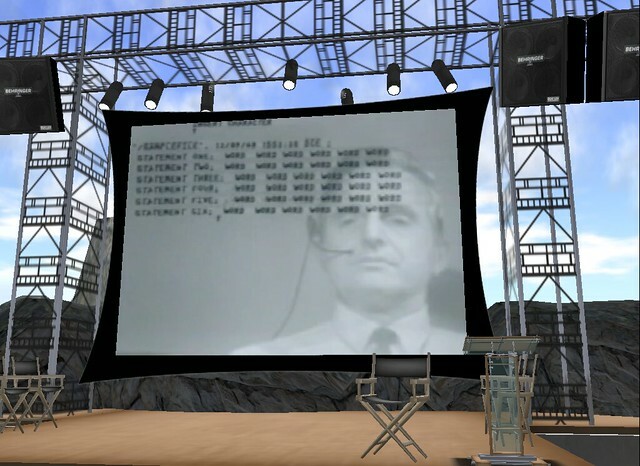 The least important question you can ask about Engelbart is, “What did he build?” By asking that question, you put yourself in a position to admire him, to stand in awe of his achievements, to worship him as a hero. But worship isn’t useful to anyone. Not you, not him. The most important question you can ask about Engelbart is, “What world was he trying to create?” By asking that question, you put yourself in a position to create that world yourself. The last of the three intro pieces for Week are published under “Roads of Annotations” — our plea for “voracious” tagging as well as some suggestions to answer the question of “how do I annotate” (it is worth noting that my name is on the post since I set it up, but that section was written by my nugget seeking expert colleague). This is all the lead up for Weeks , , and  where we dive in deeply (we hope) to annotating the Main Event paper. Those weeks will be full on, as Gardner is lining up a star studded [yet to be announced] featured annotators. These are people who are invited to add some annotations to a specific part of the paper, and then guests on video interviews to talk about and looking being their approach annotating. And this is what makes annotating, a rather old process, new again– we can be doing this thought thinking together, from different places and perspectives. There’s much more in the mix. We’re excited to be using the CROWDLAAERs tool https://crowdlaaers.org/ (thanks Remi and Francisco) to provide a visual way of seeing the overall annotation activity by date, tag, thread, and annotator. It’s quite an impressive tool to be able to use, to give a real time way to see activity. We are pleased to be there as a listed project that provides access to the three target sources of annotation for this project. And we have a bot! I had set up a version of Zach Whalen’s Google Spreadsheet twitter bot, so @dengelbot regular tweets passages from the Augmenting Human Intellect paper, e.g. I’ve also been dabbling with some duct tape to use the RSS feed of annotations on the paper be a source that our bot might tweet as well. That remains to be seen. 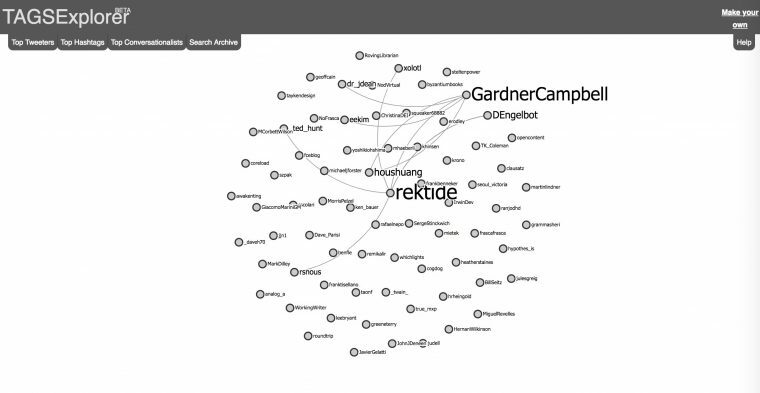 And speaking of twitter, if you do issue some tweets, please use our #augmentintellect hashtag; we have a Twitter TAGs setup to archive tweets and, with it, to generate visualization of the conversations. All aside, we are hoping to pop the doors off the system with a large amount of annotation on the full paper starting next week. 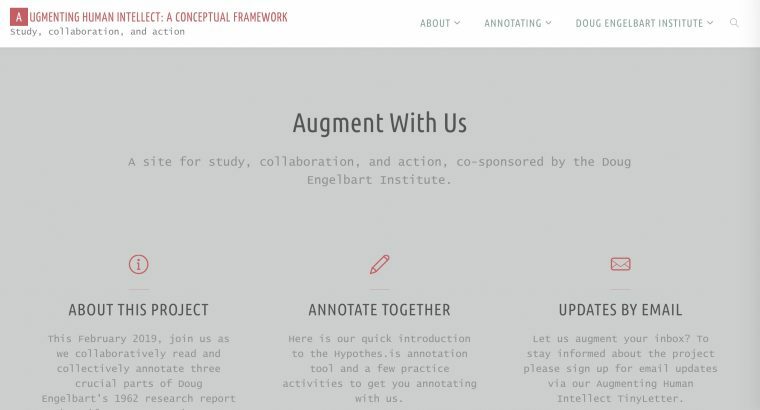 This is not a course, a mooc, a workshop, it’s just a gathering to read, annotate, discuss… augment, together. What is it about a paper, a 150 page paper? What was his intent? It was what was in Doug Engelbart’s thinking much earlier– the ideas published in 1962 way before the Mouse and the Demo. 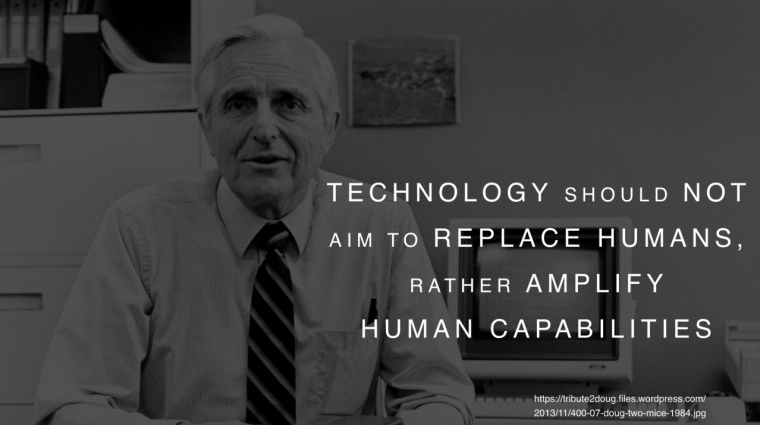 Featured Image: Doug Engelbart image with message found on blogpost on a presentation. The image itself is credited to the Tribute to Doug site but it’s one that came from the Doug Engelbart Institute. Doug Engelbart is known for something called the ‘mother of all demos’, and he also invented the mouse. They had a vision about what technology was all about. Is that really what it was about? It’s great to see this. I introduced my students to Hypothesis this month. They didn’t groove on it like I’d hoped.